UTV Side by Side Speakers. 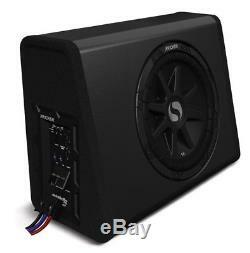 Kicker 11PES10C Single 450 Watts Amplified 10 Sub Loaded Truck Subwoofer Box. This item is Factory Certified Refurbished. 10 Solo Classic Series Subwoofer Loaded into a Kicker Enclosure. Single piece SoloKon to withstand extreme air pressure in small boxes. Stitched and glued tinsel leads for high excursion and reliability. Spiralead tinsel leads for extreme flexibility and supreme reliability. Polyimide voice coil former with Nomex reinforcement for high thermal capability. T cut top plate for high magnetic field strength and cooling capability. Recommended sealed box volume: 0.66 cubic feet. Sealed enclosure designed specifically to match with the Solo Classic's technologies. Built-in 450-watt Class-D digital amplifier. Hook and loop strap straps easily secures enclosure, and quick-connect wire harness lets you remove it when needing hauling space. Amplifier features selectable automatic turn-on modes. Crossover: 12dB/octave low pass at 50-120Hz. 8-gauge power and ground wiring is required for installation. Dimensions: 5" TD x 8-1/4" BD x 18" W x 13-1/4" H.
Building upon the success of its hard-hitting, quality sound, KICKER??? Has designed a ready-made solution for adding high-end bass to any mobile audio system with its first self-contained, premium powered subwoofer in nine years. Powered Subwoofers set a new standard in plug-in-play bass performance and convenience in a vehicle. The PES10C Refurbished SubStation Powered Enclosure mixes a 10-inch KICKER Solo Classic??? Subwoofer with a 450-watt, high-efficiency Class-D amplifier in a compact sealed enclosure. The PECVR12 Refurbished SubStation combines a 12-inch KICKER CompVR??? Sub with a 400-watt Class-D amplifier in a vented enclosure. Each provides its own signature sound while offering flexibility in today???? Once installed, Refurbished SubStations utilize a quick-connect wire harness and Hook and loop strap??? Fastened nylon straps for a simple, secure fit and pulverizing bass. When hauling space is needed, the Refurbished SubStation (both models under 40 pounds) can be easily removed by disconnecting the harness and loosening the straps. Ç It also comes with a remote bass control for fine-tuning bass levels, adjustable low-pass crossover, phase reversal, variable +18dB bass boost and three automatic turn-on options. Frequently Asked Questions for this Product. Please allow 24-business-hours after ordering before requesting tracking information. How fast will I receive my product? They DO NOT operate on weekends or holidays. Weekend and holidays are not counted as transit days. Each carrier has it's areas where service is better than another and we try to select the best service to get your order delivered in the most timely manner. We are here to help! Our customer service staff will be glad to assist you with any questions or concerns you may have. We have a service member available 5 days a week to answer your questions. All emails are answered in the order they are received and we do answer them all. We reserve the right to switch you to a comparable product if the original product is out of stock or discontinued. Empty Sub Boxes - Single 10 Inch. Car Audio - Car Audio Packages. Car Audio - Car Speaker Packages. Car Audio - Empty Sub Boxes. Car Audio Accessories - Amp Kits. Car Audio Accessories - Capacitors. Car Audio Accessories - Car Audio Accessories. The item "Kicker 11PES10C Single 450 Watts Amplified 10 Sub Loaded Truck Subwoofer Box" is in sale since Wednesday, September 14, 2016. This item is in the category "Consumer Electronics\Vehicle Electronics & GPS\Car Audio\Car Subwoofers". The seller is "hifisoundconnection" and is located in Nixa, Missouri.